Hey dolls, I know it’s been a while since I last posted a nail tutorial but today, I decided to do another for you all. 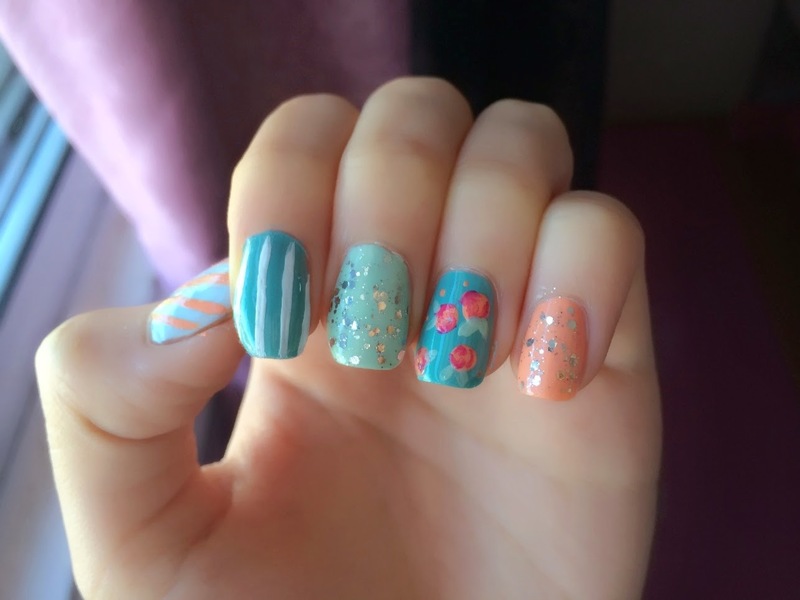 It’s this vintage floral and stripe and glitter nail design haha what a mouthful! I’ve seen this picture all over we heart it and I absolutely love the design so I decided to recreate it for today. You can use any color that your little heart desires. 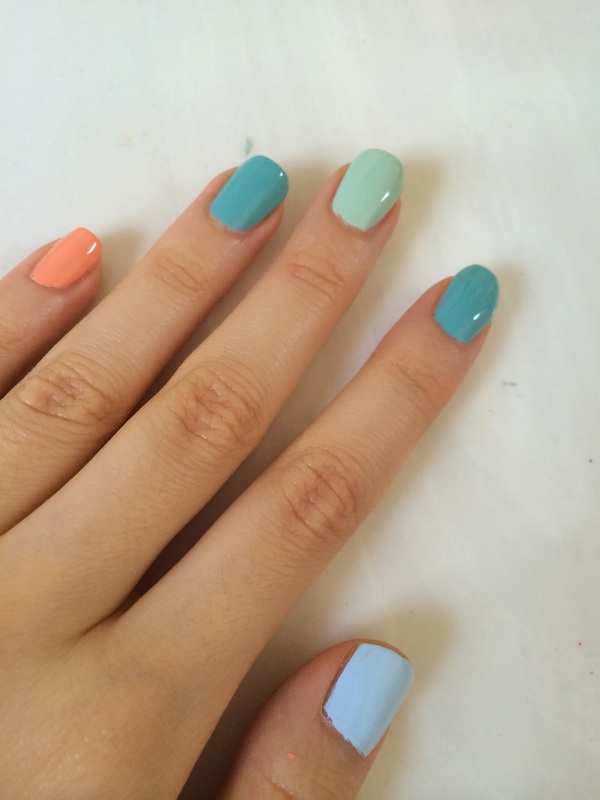 As for the base color, I used Essie borrowed and blue, China Glaze for Audrey, Sally Hansen mint sorbet, and China Glaze peachy keen. So first paint your nails a solid background color. For thumb, I used a mini nail brush and dip it into peachy keen to create the diagonal stripes. This is quite self-explanatory so just make sure that your hand is steady, it’s easier to rotate the nail than rotating the brush. You can always go back with borrowed and blue to clean up the line. Next, same thing for your index finger, just vertical stripes this time. I used OPI alpine snow to create the white stripes, again using a mini nail brush. I personally found vertical stripes so much easier than diagonal ones. As for middle and pinky finger, you would want a chunky glitter polish to coat your nails. I used Essie luxeffects in set in stone. When working with chunky glitter polishes, it’s easier to pat than swiping the polish onto your nails. Patting ensures that most of the glitters on the brush will transfer onto your nails. As for your ring finger, this is definitely the focal point. It’s actually a lot easier to create the vintage floral patterns than you think. All I did was using a dotting tool, or in my case the ball shape thingie on the pen (ugh I honestly don’t know what they’re called), I dipped it into peachy keen and immediately swirl a bright pink polish into it to crate the petals. Sorry that I didn’t have pictures of my nails while I was painting them. 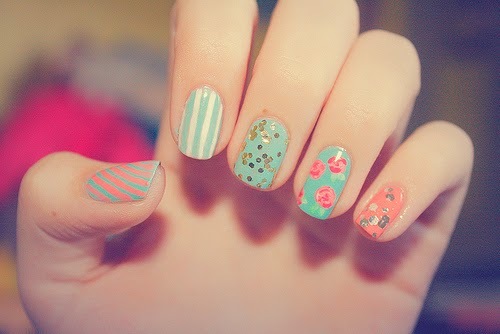 But you can find lots of tutorials on youtube on how to create floral patterns on your nails. Lastly, I just created some leaves using the mint polish. And voila! I hope you enjoy this quick nail tutorial. Let me know what you think in the comment down below! Wow so cute - I love the stripy ones! !